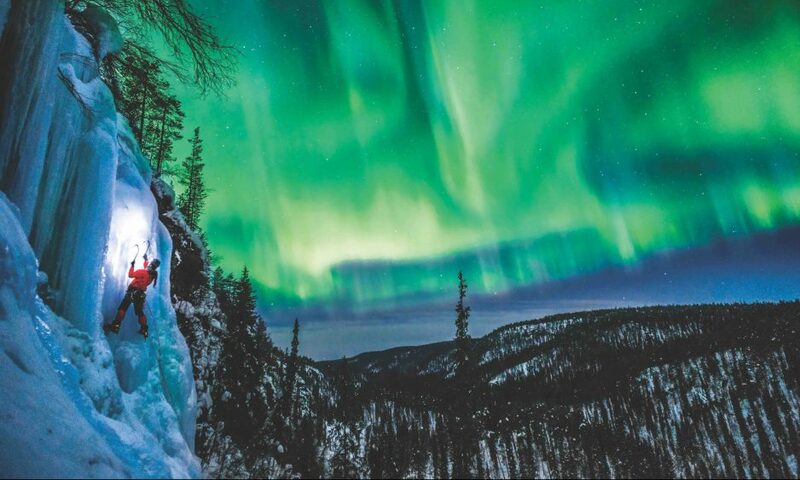 Daniel Herrera tackles WI 4 ice under the dancing skies of Korouomu, Posio, Finland. Photo: Nico Pena. This article appeared in Rock and Ice issue 255 (January 2019). 1994 was my year to climb Grade 5 ice. Back then I thought ice-climbing training meant doing of lots of pull-ups. I mounted a bar in the hallway, latched onto it, and got ready to rip. Boom! The bar ripped through the drywall and sent me tumbling onto the linoleum floor. Still, I did pull-ups: thousands in total, and it worked. I climbed Grade 5. The next year I added lock-offs and typewriters (pulling into a lock-off and moving your chin back and forth above the bar). But I wasn’t really training as much as I was doing random exercises. It worked—to a point—but the next few seasons I didn’t get stronger, nor could I climb harder. It wasn’t until 2001, working with a coach, that I discovered the power of training: purposeful workouts that lead to an ever-higher level of fitness and confidence. With the right direction and a smart plan, you can be better and stronger than I was—and sooner. To train for ice (and rock!) you must understand three principles: continuity, gradualness and modulation. A good training plan respects these time-proven principles of athletic development. 1. Continuity is training without a break. This doesn’t mean you should train constantly or even daily, rather to time each training session so it corresponds to a period when you are fully recovered— supercompensated, to use the coaches’ term—from the last training session. 2. Gradualness means that you need, from workout to workout or week to week, to increase the training stress gradually. Failure to increase training stress usually results in a plateau. Ramp up your training too fast, though, and you can stagnate, then regress. 3. Modulation is varying the training stress from hard to easy. This will be both on a day-to-day or week-to-week cycle. Correct modulation gives your body a chance to get stronger during the rest periods. 1. 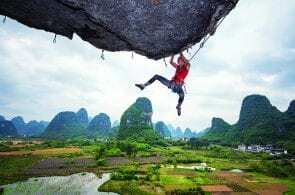 Increase the volume of climbing, easily measured by pitches or vertical feet/meters, by five to 10 (maximum) percent each week. 2. Focus on the volume, not difficulty, of pitches. Don’t get tempted onto harder lines. This is stamina training, not to be mixed with power training. 3. 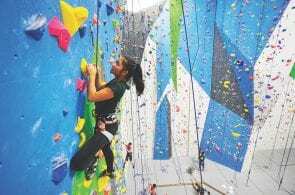 Find a style of rock climbing that mimics the style of ice/mixed climbing that you’re training for. If you’re training for the Canadian mega-classic Polar Circus, a nine-pitch but mostly less-than-vertical route in the Canadian Rockies, then climb mostly on less-than- vertical rock. If you want to crack the podium on the ice-climbing World Cup, focus on very steep roofs. Grip strength is the limiting factor for most ice climbers, especially on lead. Use the following exercises to improve here. Determine the maximum weight that you can suspend from your harness and then hang on tools for 10 to 12 seconds before melting off. 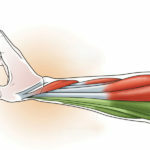 Hang on both arms while keeping active, not slack, arm, back and shoulder muscles. WEEK 1: Using your maximum added weight, complete one 10- to 12-second hang per minute, followed by three minutes’ rest. You’re done when you can no longer consistently hang for eight to 10 seconds. Do two times a week. WEEK 2: Hold the weight steady from last week’s workouts. Do eight minutes of 10- to 12-second hangs per minute followed by a four- minute rest. You’re done when you can’t consistently hang for eight to 10 seconds. Do two times a week. WEEK 3: Increase the weight by 15 to 20 percent over last week’s workouts. Do six minutes of six- to eight-second hangs per minute followed by three minutes’ rest. You’re done when you can’t consistently hang for six seconds. Do two times a week. WEEK 4: Hold the weight steady from last week’s workouts. Eight minutes of six- to eight-second hangs per minute followed by four minutes’ rest. You’re done when you can’t consistently hang for six seconds. Two times a week. These progressions are adapted directly from isometric training theory and will increase the strength capacity of your grip in this position, so that you will require a lower percentage of your absolute strength when you grip and swing ice tools. Lock-off training should be part of every ice- climbing training workout. First the warm-up: Start by doing eight to 12 pull-ups. If you cannot do eight, that’s O.K., use a toe on a chair or another method of taking weight off so that you can complete eight. 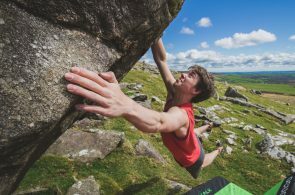 If you have a bouldering wall, do five minutes of easy bouldering, followed by 25 Burpees at a moderate pace, then 20 TGUs (Turkish Get-Ups) with appropriate weight (10 pounds per side), followed by 10 dips (bench, rack or ring depending on your strength). Burpees and TGUs do not pertain to climbing per se, but warm up your entire body. Then do another eight to 12 pull-ups. Finally, add a little shoulder-mobility work. 1. Place a clock or timer in view. Pull up into a lock-off position. I prefer to use one ice tool, doing a pull-up with one hand on the top grip and with my locking-off hand on the bottom (large) grip. Let go with the upper hand completely. Hold the one-arm lock-off for 12 seconds or until you start to shake. Then put your free hand back on the ice tool and lower yourself back down. If you can’t hold a lock-off, use a chair or support for one foot, or grip the tool, bar or rings with both hands. 2. Now switch hands so the opposite hand is on the opposite grip on your ice tool. 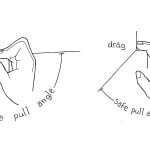 Pull up into a lock-off position, and drop the upper hand to your side. Hold on that side for 12 seconds or until you start to shake. Remember, training is not random exercises. Training is a strategic process, and it absolutely works! 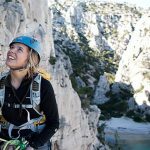 Put these principles to work, add a dash of real climbing, and you’ll be on your way to your strongest ice and mixed climbing season yet. 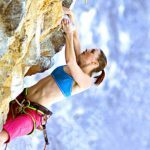 For an in-depth review of training for ice climbing, check out this long read at Uphill Athlete. 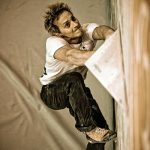 Steve House is a professional climber, alpinist and coach. You can email him questions at coach@uphillathlete.com. Training methods to avoid, and what to do instead. Grip Trainers - Gimmicks, or Worth the Money? Chronic Crimpers – Why Do I Crimp Everything?